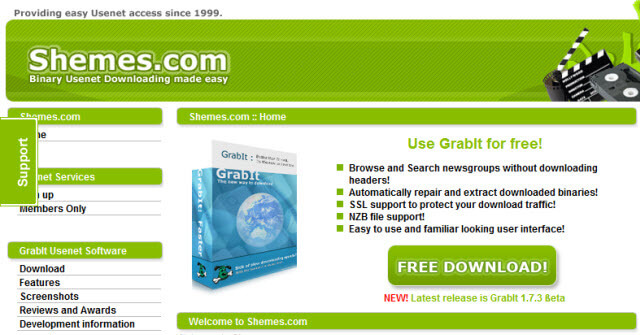 GrabIt, one of the easiest Free Usenet Newsreader. With GrabIt you can search and download any content on USENET news servers, without downloading gigabytes of headers. GrabIt can have as much as fifty simultaneous connections and has NZB and Yenc support. You can signup for Grabit Free Newsreader Account. Newshosting offers a 7 day Free Usenet Trial and is compatible with Grabit Free Newsreader. So see for yourself. GrabIt, like a few other newsreaders, includes a search function. The search function checks and looks into all the newsgroups on the news service of the schemes. For a user that wants to find a particular article or binary, this is of great benefit. The con to this search is that a user is restricted to doing a fixed number of searches without subscribing to the Shemes news service. The queries that would be returned will only be the ones the Schemes service lists and not that of the user’s service. returned will be those listed in the Shemes service and not necessarily of the user's service. For GrabIt Beta 1.7.2 Beta 3 SSL encryption has now been supported. A lot has been put in place to ensure that downloads of binaries are as easy and fast as possible. It’s the reason a lot of people signup for Grabit. You don’t have too waste your bandwidth and time downloading data over and again anymore! Grabit continues from where you paused or stopped your download. It will resume from that same article. It’s smart like that. GrabIt completely supports the popular NZB format. On your desktop, only double click on an NZB file and Grabit will automatically download all files described in the NZB file. In a situation where you want to make repost request or thank someone for their amazing post, you don’t have to begin another newsreader to post that message, if you have Grabit running. All you have to do is hit that post button, enter your message and leave Grabit to handle the rest. Grabit automatically repairs and extracts your downloads. Fill up your batch and leave your PC running when you return it will be completed without fail. All your traffic to Usenet server is fully encrypt with the industry standard SLL technology.